Progressive weight training is not limited to the simple increase of weight in a given exercise to increase muscle mass. Progressive weight training can encompass time and timing -- two complex considerations for the bodybuilder. To begin, count your most important 'peak' of the year as the ending day of your training plan and backdate 365 days from that point as the start. The theory is to divide the year into seven individual time periods each representing increased training intensity. Frank Zane was one of the originators of this type of training applied to bodybuilding. 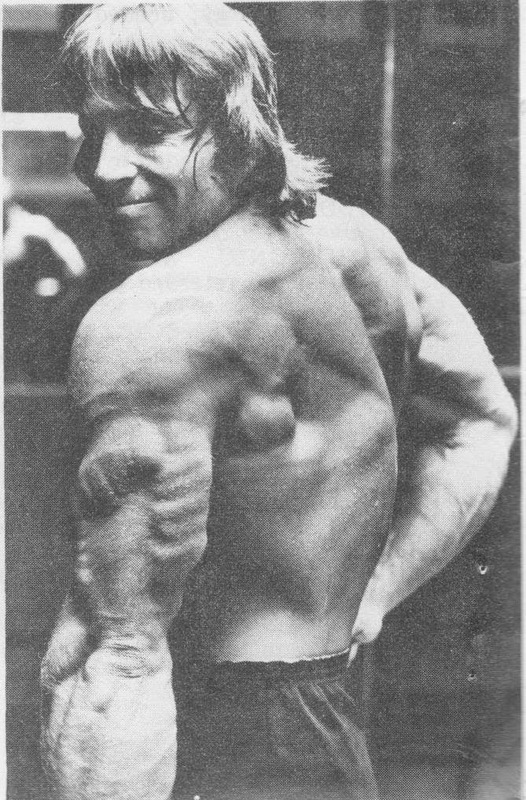 He applied it to his training with success that is now bodybuilding history. Using this training method I was able to go from a fourth place finish in the 1975 Mr. Los Angeles to winning the AABA Mr. California and Most Muscular, and taking second place in the AABA Mr. America. This training program will transform your physique like none other because it's really a framework that you will personally design. This level is the foundation for your entire year's training. You should try to avoid any injury for the year by insuring that you start with light weights and proper exercise performance. You should plan to work each of the body parts (shoulders, triceps, biceps, forearms, chest, back, legs, and waist) three times per week using one exercise. Do three sets per body part and train the entire body each day. Begin this level after a short layoff following the prior year's major peak. Stay at this level for 5 weeks. Work each body part twice per week doing five sets. Use a split routine and train the upper body on Monday and Thursday, the lower body on Tuesday and Friday. Again, use only one exercise per body part. Stay at this level for 8-10 weeks. Work each body part twice per week, however, select two exercises for each body part and do five sets of each exercise. Use the same split routine as Level Two. Stay at this level for 5 weeks. Select three exercises per body part and do five sets per exercise. Again work on the same split routine. Stay at this level for 5 weeks. Monday/Wednesday/Friday - Shoulders, Triceps, Biceps, Forearms, Calves. Tuesday/Thursday/Saturday - Chest, Back, Forearms, Legs, Abs. Stay at this level for 10 weeks. Increase the number of exercises to three per body part and stay on this level for 10 weeks. This level should take you successfully to your main peak of that year. Increase the number of sets per body part to 20, training each body part three times per week. This is the level at which you are to put the final touches on your physique this year for that look of total preparedness. Much like a chef, the bodybuilder must bring all his body parts to readiness at the same time so that the whole body becomes greater than the sum of its parts. One way to insure readiness is to spend time posing during this period to further bring out that finished look. A word about the repetition counts. When doing 3 sets of an exercise start with 12 reps; add weight, do 10 reps; add weight and do 8 reps. The basic 5-set approach begins with a light weight for 12 reps; more weight and 10 reps; more weight and 8 reps; more weight and 7 reps; more weight and 6 reps.
Don't rest longer than 15-30 seconds between sets EVER. The shorter the rest periods between sets, the greater the work intensity. I say nothing here about the specific exercises you might use. The reason for this omission is that it is your responsibility to find the exercises that work best for you and use them. Select exercises that are best for your body type, your training style and for your development of symmetry and proportion. Nutrition is 75% of bodybuilding. Don't get your information by hearsay. Get good books on mega-vitamin therapy and other nutritional practices. Keep an ear open in the gym, but at the same time keep your eyes on the writings of nutrition experts as they come out, even if they themselves are not bodybuilders. I've often heard bodybuilders brag about how much protein powder or liver tablets they consume daily. This is the tired old quantity theory that assumes if One is good, than One Hundred will be that much better. Nonsense. Keep your supplement and food thresholds as low as possible. Why not try to get all you need from the least amount. Again, use the 'levels' approach on your personal nutrition. Start with minimum amounts and increase them only as the need arises -- say, from more intense training. Vince Gironda told me that he never takes the same supplements each day. He takes what his body tells him he needs instead. Eating, taking supplements, and training are parts of the process that are different each day. The novice should react to his diet and supplementation as the need arises, even daily, and so should more advance trainers. Finally, use the parable Know Thyself to its utmost. Know or learn what makes you tick, what your goals are, what exercises work for you, what supplements and foods you need and when, and the right level of physical development to be on. It's a little harder to train instinctively today, because so much is done for us. But I maintain that time will be saved and higher levels of success will be reached once you learn to teach yourself, and learn from yourself and your personal experiences.